You know your rifle, your dope, and you are the best Rifleman among your group of patriots. These citizens are counting on you and your rifle to hit things further out than what they feel they are capable of. From small game, to distant threats, or simply difficult shots… That weight is on your shoulders. Well that’s an uncomfortable thought. A hurricane just blew through and you want me to be the neighborhood marksman? Well OK, I will certainly take up that mantle in a SHTFANTASY. So what tools can you use to make yourself more effective? What type of support can you obtain to maximize your ability? Gear and equipment setup is a lifelong work in progress. This is a WIP for a grab bag I have been working with over the years. I have used it in competitions, and it now sits in my closet next to my gear, ready to go at a moments notice. It can go to the range with me when I feel spartan and want to take the minimum, and its ready if a bump in the night occurs. It’s versatile, and modular… if not a bit small. So let’s check it out. The bag can be used as a soft support for hard surfaces. I have used it in this way many times. I first used a Maxpediton Remora in two practical rifle competitions in Pennsylvania many years ago. What I learned is that these bags like to get in the way of things. They roll to your front when trying to go prone, they get hung up on things, and generally make a nuisance of themselves as you attempt to get into position. Call them “active shooter bags” or a “go bag” or whatever you want, but they are a pain in the rear. That said, if you want this bag to go with you, it better be worth your while. So what did I put in the bag? Not every situation will call for a support bag, but in other situations it has valuable tools that a rifleman can use to ensure greater probability of a hit at longer distances. It’s up to you to decide if the advantages are worth giving up other gear for the advantages of the kit. So what’s in the breifcase bag? The bag is comprised of elements that will support your marksmanship. Even the bag itself is a tool to support your marksmanship. The bag and its contents are universal in nature. It is intended to assist you regardless if you are packing a M16A2 or a modern DMR build. Vortex Solo R/T: this is an instrument I have had in mind for a long time, and finally got around to equipping. This is a monocular with a mil rad ranging reticle and a quick glance measurement tool for estimating distance on the fly. Bryan Litz has made note that one of the biggest indicators of positively increasing hit probability on a distant target is accurate range estimation. It’s vital. We can use, tricks, electronics, guestimation, etc but many of these processes can fail or will fall flat. Having a simple *no electronics* tool at your disposal to range a target will aid your efforts to get accurate ranging data. It’s no laser rangefinder, but its far better than guesstimating. Cities have many landmarks that can be used to pre-range your firing lane before things go sideways. Another benefit of such a product is the ability of handing the monocular to a co-patriot to spot your shots. While 8x isn’t at spotting scope power, it is still useful for a spotter to watch your shots and call out corrections. They can even range for you while you keep your rifle running. Your team will benefit from the data you can collect with this tool regardless of the platform they may be using. Range landmarks for dope reference to better defend your fixed position. Spot game. Scan for threats with your glassed rifle and give the monocular to a buddy who only has a red dot. The list goes on and on. This tool goes hand in hand with the ranging monocular and mil-dot scope. It requires no batteries and will aid you with finding firing solutions for long shots even when your shooting uphill or downhill without math. It’s 29 dollars of “worth it” all by itself. The Mil-Dot master sits quietly next to the Solo and bullet card. The Mil-Dot master assists the rifleman with range calculation and augments your ability to figure distance to target among other features. My pack has a IFAK inside. Maybe you already have a IFAK personally equipped, but having extra will be a boon to your fellow patriots. I like that it also adds volume to the pack and a bit of squish. This permits me the ability to use the pack for shot stability and prone rifle support. Tourniquet attached outside, and inside more first aid equipment in a divided pocket. Data is important for a rifleman. Log your zero’s with the book, and take notes so when you switch brands of ammo you can dial corrections. Having this reference with you will decrease ammo expenditure at the range should you need to sight in with a product you have used before. I use Rite in the Rain books for data since it is waterproof. It travels next to the ammo card and mil-dot master in the main compartment. I keep extra support gear to keep your rifle and attachments securely planted on the rifle. I have a front sight tool, spare small parts, and the tools necessary for keeping the optic happy. Cleaning cloth, lens brush, etc. A tool pocket with common rifle tools will only aid you and your fellow rifleman in the field should something get loosey goosey. Believe me, everything will eventually get loose and having the tools to fix it is important. Wrenches, iron sight tools, a glow-stick, marker, and other gun tools come along for the ride. More ammo in the bag. I have a old 2 deep velcro M16 pouch, and I store two fresh magazines here. If the pouch is empty, it can carry a few nick nacks or I use it as a quick access pouch for my hand held monocular as it closes fairly securely over it. I also have a 20 round ammo card which I intend to outfit with some long range loads. 80 grain AMAX rounds will be a good fit for the card as they are single load items, and they could be pulled from the card and dropped into the chamber one at a time for some extra range. Yes, it is all inside. Here it is outfitted with an extra Fast-mag pouch on the left side. The Vortex SOLO sits in the double magazine pouch. 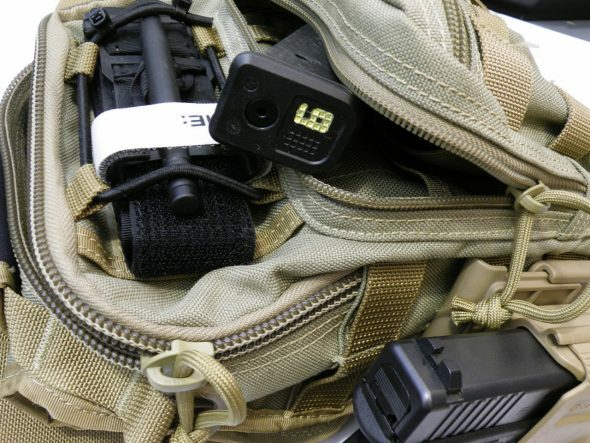 There are multiple ways to build up a “go-bag”. As you see here, my Maxpedition Remora is outfitted with a light-weight kit that fits my vision for a go bag / rifleman’s support bag. There are much bigger bags that can hold much more gear, but I still have plenty of room in the main compartment for a Kestral (on the shopping list) and any other smaller shooting tools I can acquire. This is simply a piece of gear to grab if the situation calls for it. Outfit your bag with what you know you will need. In this case, my bag supports more eyeballs on target, allows the collection of solid shooting data, helps stop bleeding, and carries more fun pills for the road. I like that setup. I’ve got a similar smaller “go bag,” but used an SOTECH Mission Go Bag A1. That bag looks allot roomier than mine! Cool idea. I may need to take it into consideration & replicate, with my own personal touches, of course. Do you have any concerns with it looking (to my eyes, anyway) like something only a gun-guy would carry?